There has been a lot of talk around the office about New Year's resolutions. Every year we make a goal, and almost every year we forget about it before May Day. Why is it so hard to follow through? I think it's because of the nature of a resolution. We have all year to reach an amorphous goal. I want to lose weight. I want to quit smoking. That's great, but it's not enough. Think of a New Year's resolution as an exotic pet or delicate flower. It's not enough to have one, you need to take care of it. Resolutions must be nurtured and fed often or they will wilt away into another year of stagnation. 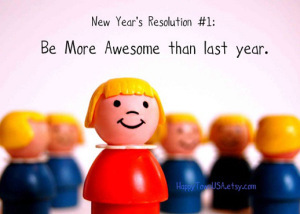 Keeping your resolution alive and thriving is all about goal setting. So grab a pen and paper and let's get started! First, set your resolution. What do you want to achieve this year? For the sake of this example, let's focus on weight loss. My New Year's resolution is to lose weight! (Write it down) Now that we've adopted that particular pet, let's start taking care of it. Each week, you need to set small, attainable goals to help feed your resolution. Ask yourself: What can I do this week to help me keep my resolution? If we're trying to lose weight, we should start by eating healthier and getting more exercise, right? Go ahead and write that down. Now ask yourself: What are 3 ways I can achieve this? So you want to eat healthier- how are you going to do it? Let's eat more fruits and vegetables. Need more exercise? Let's walk more. This is where most people end their goal setting, and that is why so many people fail. We need to go farther! Specifically, what will I do? You could swap your usual afternoon snack for some carrots. As for walking more, how about a 20 minute walk after dinner? These should be very specific actions. It's not enough to say you will stop snacking in front of the TV. I want you to write down that you will knit a scarf while watching TV instead of snacking, or you will only drink unsweetened hot tea while watching TV. Be specific, but be realistic. Now that you know exactly what you are going to do, ask yourself: How often will I do it? Don't fall into the 'everyday' trap! Consider your life and your schedule. It might not be reasonable to get to the gym every day for one hour. But can you get there twice this week? Can you choose veggies instead of chips at work 4 days this week? Can you take a 20 minute walk after dinner 3 days this week? Go ahead and write it down. 1) I will eat more vegetables by snacking on carrots at my desk instead of chips 5 days this week. 2) I will get more exercise by taking a 20 minute walk after dinner 3 days this week. 3) I will choose a piece of fruit instead of a pastry for dessert 5 days this week. You should aim for about 3 goals per week; that way, if you don't meet one, you'll probably meet another. Feel free to repeat goals you haven't met, or goals that are very helpful for you. Now ask yourself, will I be able to meet these goals? Are these goals challenging? Are these goals within my control? If you answered yes to those questions, you have created goals that will help you keep your New Year's resolution! Go through this exercise each week, making new goals and tracking your progress. Write down everything- the goals you reach, the ones you don't, and how you are progressing towards your resolution. By this time next year, you'll be a resolution pro! Which is good, because by then it will be time to adopt a new resolution! Katie Schaeffer is a graduate student at D'Youville College, completing her master's thesis is dietetics, focusing on improving urban food environments. She has a background in environmental science, agriculture and nutrition. A 15 year vegetarian, Katie advocates eating a mostly local, plant based diet to improve health and the environment. She is a member of the Academy of Nutrition and Dietetics, the Western New York Dietetics Association, and the Dietitians in Integrative and Functional Medicine practice group. In her spare time, she enjoys cooking meals for friends and family, singing with the Buffalo Choral Arts Society, and making her own clothes. She loves a good road trip and experiencing new places and new foods. Katie lives in Buffalo with her husband Hill and their dog Brody. Her favorite food is tofu. Not really. It's actually coconut cake.